Hi guys, so I have just finished my first build of a Reprap Air 2 XL version using Sanguinololu. I didn't connect the Heatbed MKII and the Endstops yet. So I thought: lets connect this puppy and see what is does! Plug in the power supply 12v supplied by reseller: USB cable starts to heat up and within about 10 seconds the cable starts to get so hot it begins melting I didn't want to try to connect it for much longer so I turned off everything immediately. Luckily there is nothing broken yet, at least, my computer (iMac) is still working. About the Sanguinololu or everything on it I don't know if it still works. Does anyone know how the USB cable can start to overheat immediately after turning on the power supply? Within 10 seconds the cable already becomes so hot I can't hold it with my hand anymore. New problem: LED doesn't turn on anymore, Sanguino broken now? Ok turned out the polarity of the power supply wasn't right. So I turned it around and everything worked without overheating USB cable. I could connect with the Sanguinololu board but couldn't move the motors. After some 20 minutes of looking what I could've done wrong I decided to turn off the power supply and see if I could connect with the board just using usb. And then the trouble started, the light on the Sanguino wouldn't light up anymore and when I re-attached the power supply, nothing happened either. So I took off the power supply again and tried a reboot of my computer, after that I reconnected the USB cable and still nothing happened, I noticed that the USB cable was getting warm now, not hot, but warm. I feel like it's all broken now and I have no idea how and why. I have a moderate understanding of mechanics and science and cannot understand what could've possibly gone wrong. Are there things I can check with my multimeter on the board to see it everything is still working right? Edited 2 time(s). Last edit at 03/17/2013 07:12PM by Ohmarinus. Actually it turned out my Multimeter was malfunctioning and the polarity was working correctly in the first case. Now after I switched the polarity I probably broke the Sanguino. This is so bad I have nowhere near the money to replace it now. 1 Stepstick is broken, the other three are just fine! Without the 4th stepstick the sanguino is perfectly accesible through pronterface and I guess I'll just have to replace that one and I'm good to go again. Edit: I should start keeping a diary sorry for the overflow of 'me'. Edited 2 time(s). Last edit at 03/18/2013 06:18PM by Ohmarinus. Wow, you've been really, really lucky to only have one driver broken. I'm amazed the motherboard of the computer isn't broken, or that the Sanguinololu isn't complete toast. I can only think that the broken driver failed short-circuit, saving the rest from reversed polarity. Yep I think you are right. 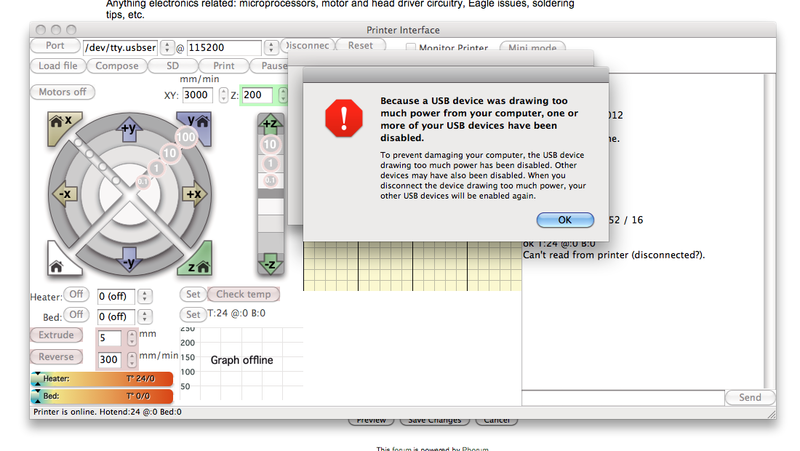 But I'm still having the same issue, my USB cable fries when I turn on the power (correctly set-up this time). Edited 2 time(s). Last edit at 03/20/2013 06:24AM by Ohmarinus. To heat up a cable, one needs considerable current, so can assume there is an obvious short somewhere. Only need to identify where the short is located. Normally one of these measurements should pop out and point where the problem is. Checked the sanguinololu schematic and i dont get much. I would use 5v from onboard regulator instead of using 5v from usb, and these 2 should be kept separated with a switch or smth, but from schematic these seem to be connected to each other, i would rather use a switch between. There is a switch, but that seems to change the endstops supply from 5v to 12v (i dont get why is that?) but you may check the status of that and if its on short or something. As an experiment, you can try in reverse. With no usb connected, connect and power on the psu, and measure voltage right after the 7805 voltage regulator, to ensure that it does actually make 5v by itself. Its the big one on the far right side. The 3 legs should be 12v, gnd, and 5v. I replaced the stepper that was broken on the Sanguinololu board, I turned on the device without the USB cable in. Immediately the stepstick that I replaced started to heat up like crazy while all the others were still at room temperature. It is the stepstick closest to the PSU input on the Sanguino board. Can it be *hypothetically speaking* that the person I bought the Sanguino board from made a mistake when putting it together? I can't even start to measure because as soon as I turn on the power supply the Stepstick starts to heat up in a linear fashion and I'm afraid I will burn it. Or can I measure the voltages on the Sanguino without the stepsticks in place? Thanks for your reply NoobMan! Take out that stepstick (and all others, and everything else that can be disconnected) and offline (no power) measure resistance at its points, between the 12V, 5V to ground. Both on that stepstick and on its corespondent connection pins on the board. Do the measurements on each side after all parts have been disconnected / taken away. For example 1a 2a 1b 2b are stepper driver outputs and once the driver is out of its socket, these lines should not connect to anything else, not even to each other. Not to mention that on startup the driver outputs should be off (enable is high, =5v), and are off till chip receives a move command. So chip outputs arent of the nature to create some behavior like described. Just do the offline (no power) of resistance measurements on the voltage lines like above. That may point to something. The experiment is only to see if the 7805 does work e.g. provides a good 5v by itself or not, e.g. with no usb connected. Edited 1 time(s). Last edit at 03/20/2013 07:49AM by NoobMan. Hey, it's not getting any clearer. I can't seem to find much wrong here.. I have emailed the seller and we agreed on me sending to him the power supply, the sanguino and the stepsticks so he can check it all out. Thanks for everything so far, I will update what was wrong when we find out! If it would be a guess i would think the 7805 failed and lets the full input across output and hence it gets sinked through usb cable. Could try check that. Discovering a short somewhere would of been better / preferable. Btw, If you find the cause of this later on, perhaps update post so it may help others. Yes, I will tell the seller that that might be the case! Btw, is it just recent that the forum keeps being inaccessible? Since today it seems better again, but the last few weeks have been very bad for me, especially since I really 'needed' the forum to see how to build my RepRap Air 2 XL. Yes for me too the forums were going poorly in last couple of weeks. I think the amount of info&visitors very is big and its quite a hard and probably becomes increasingly harder to host this - for those doing it. For now the 7805 is replaced and the firmware is loaded again. It all seems to work, will receive the Sanguino back in a few days I guess. Apparently all the other stepsticks were also burned. According to the seller who is checking my board now. Weird, because with those three stepsticks my board worked fine, it only didn't work with the one broken one. So apparently the other three were also broken but the sanguino would still turn on with those stepsticks in place. I am getting a weird feeling about this. Hahaha ok, apparently the seller sold the wrong email to me, the stepsticks weren't broken, only the 7805. I asked for some clarity, but it's hard to get clear answers, each time I have multiple questions in an email he only answers just one random one and thats it. I hope it will become clearer so I can tell what happened. Lol, he sent my sanguino to the wrong person accidentally and now I'm getting a brand new with new stepsticks etc..
Edited 2 time(s). Last edit at 03/24/2013 05:47PM by Ohmarinus. I received a new Sanguino board with new stepsticks. Working on everything now, currently stuck at the point of configuring my Stepsticks.. Which I have no idea how to work the formula I found on the wiki. You need to know the sense resistors exact value. The value that is adjusted from the pot is the voltage between two points. That voltage gives the current setting to drive the motors by formula A = VREF / (8 * RS). So for 0.05R sense resistors, about 0.3V of Vref will give you ~0.75A. In this case i would not try to go more than 0.3-0.4V coz it would set current probably too high. But you could have different sense resistors so may need to change the math accordingly. I would set the Vref for all drivers while the motors are disconnected from the outputs. Then with correct vref settings, turn off everything, connect motor wires, and power up with motors. This is to avoid a situation where i would have the vref way beyond max, and the motor connected to the output with such a setting. Do NOT disconnect the motors or fiddle with wiring when driver is powered up, coz this will probably burn the driver. first of all, are you informed about the Rsense value on ur stepsticks? with some light fingers and a steady hand, adjust the mini trim pot so that it reads 1volt ref to ground. caution not to short anything, it is very easy to blow drivers crossing or shorting anything else. but @ 2.5a, ur steppers/drivers will get v hot v fast. i did mod my steppers with heatsinks for that reason. i be interested to know if ur setup would produce even steps w/o mods ... u think u can post a vid? > stuck at the point of configuring my Stepsticks..
> found on the wiki. Edited 1 time(s). Last edit at 03/30/2013 07:00AM by redreprap. Hey, thanks for your reply, I still haven't gotten things running. Not sure if this is such a good idea, I have asked a friend who has put Vref at 0,7 and he says it works well. Feel free to comment on my work if you see anything that is not in order in my Sanguino! I have replaced some wiring with thicker wires that have a solid core instead of the copper bundle of smaller wires. For example the hotend wiring. I hope my wiring looks neat it's the first time for me I'm doing electronics like this. I will buy some electronic stuff again this afternoon and after that I will start trying out to get this machine working! > value on ur stepsticks? > even steps w/o mods ... u think u can post a vid? > > found on the wiki. Edited 2 time(s). Last edit at 03/30/2013 08:26AM by Ohmarinus. i guess 0.7v will work too (1.7A drive, about 2/3 the torque i think). but it is always good to find out what the Rsense are. if you have a chance to spot a certain digital multimeter Uni-T UT61E, it measures down to 0.01ohm, and you need to have 1, go grab that. it should not be more than US$80 in stores. Just by hand-tuning them I managed to get them all working on their lowest possible energy level. The only thing I find weird about the machine is that my extruder stepper makes a pretty annoying high sound, while all the others are all perfectly silent. Also another weird thing is that the stepper motors seem to move the wrong way from what is shown in the pronterface menu and when my motors hit the endstop, they just try to go through it. > out what the Rsense are. > should not be more than US$80 in stores. plug your steppers into the ramps (that 4pin thingy) the reverse way (1234 --> 4321), it will move in reverse and it should make the endstops "see" it in the correct direction. Edited 1 time(s). Last edit at 03/30/2013 02:18PM by redreprap. Hi I'm using a sanguino with 4 stepsticks, so no RAMPS. But if it can't do any harm to just turn around the connector, then I will do that. Are you sure it wont do any harm? I have a picture here of my setup, I'm afraid I might have put the X-axis bar the wrong way around, the stepper-motor is on the left side of it and I see both ways in different images on the web, shouldn't it be on the right side? > "see" it in the correct direction. yea its ok, imagine a DC motor, reverse the cables to reverse the rotation. its the same, just dont mess up the order. and power down to do it, doing it with power on = fried electronics. It doesn't matter what side the motor is on for the x-axis. I have mine on the left side.